Not far off the coast of port city Incheon, which will host next year's Asian Games, Wolmido Island, named after its shape in the form of a crescent, is the perfect daytrip for those looking to break from city life. After attending a business conference just west of Seoul, at Incheon's Songdo International Business District, I wanted to forget about work and escape to someplace relaxing. The nearby island popular for its seafood restaurants and amusement park, about a kilometer out, connected to the mainland by highway more than 20 years ago, seemed like the perfect option, given that its waterfront boardwalk, street food and carnival rides were just a hop, skip and a jump away. Visitors to the island surrounded by the Yellow Sea are welcomed by a figurative art piece resembling a seagull with its wings waving guests in. A few minutes walk away is Culture Street, the hub of commercial activity for tourists. 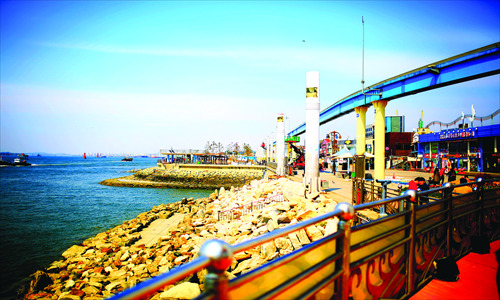 A number of eateries specializing in fresh seafood dishes, cafes and bars, and of course, an amusement park accompanied by a 650-meter boardwalk by the water. I arrived early in the morning, when it was still quiet, but no matter where I stood, a light breeze followed me, bringing with it a taste of the sea. By the water, rocks were snuggly arranged. Carefully, I stepped down on them, immersing myself at sea as waves crashed below me, wetting the tips of my shoes. With the sun on my back, it was a calming and peaceful moment that I was eager to make last a few minutes longer. Along the shore, I saw many Korean people fishing recreationally, relaxing by the water. With their buckets still empty, they chatted and smoked, patiently waiting for fish to bite. With their rods up and sleeves rolled, they had a carefree way about them which was envious. The Wolmi My Land arcade on the east side of Culture Street is a must for gamers looking for an excuse to spend the day pushing buttons and beating high scores. Thrill-seekers, however, should make their way through the park for carnival rides, while those wanting a view of the island from above should head to the Ferris Wheel. With plenty of games to play and toys to win, the park is an especially attractive choice for families with young children. Though I was told that the seafood restaurants here are definitely worth a try, I decided to skip the big meal and save a bit of cash, after the spicy and savory aromas wafting over from the food stalls persuaded me to see what was on offer. The chicken fillet with hot sauce and a large bowl of Korean stir-fried rice cakes were undeniably delicious and filling, giving me just the energy I needed to carry on with my island tour. When you get restless of the waterfront scenery and rides at the park, head on over to the Museum of Korea Emigration History. At the south end of Culture Street, it is about a 10-minute walk from the Ferris Wheel. Set up in 2008, the museum is the first to focus on the movement of Koreans. With my free audio guide, I excitedly began the tour. 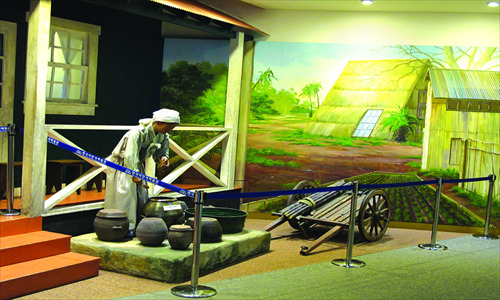 The second floor of the exhibition hall is dedicated to telling the story of Incheon as the departure point for migrants when it served as an open port for trade in the late 19th century. The first large group of Koreans left here for the US in 1903. It was a rough journey for the early migrants headed for Hawaii, but gradually, as more Koreans settled there, they managed to set up their own community of schools and churches in the US. A collection of items from some of the country's early US immigrants include the luggage taken with them to Hawaii, and even the sickle they used for farming once they arrived to America. The impressive displays that look back on the period of history made it easy to see how the US and South Korea were able to form such a close relationship, which remains strong to this day as evident by the presence of American troops in the southern Korean peninsula. Wind down your tour of the island at Inchon (now Incheon) Landing Operation Monument at the north end of Culture Street. The black-stone monument that reaches a height of 2 meters represents the place where the first US Marines landed at "Green Beach," or the northern side of Wolmido, to start the critical operation of liberating Incheon during the Korean War (1950-53). Here, the Battle of Inchon proved a divisive point in the war, laying the foundation for the current relations between the two Koreas. Nothing like the scene of anguish and flames during wartime, Wolmido Island exists today as a peaceful and relaxing place for leisure, in stark contrast to the devastating events that unfolded in the area 60 years ago. Though such dark images made for a bitter-sweet day of emotions, as the sun lowered in the horizon, I felt a sense of serenity and was ready to find my way back to the city. How to go: Public transit is available. 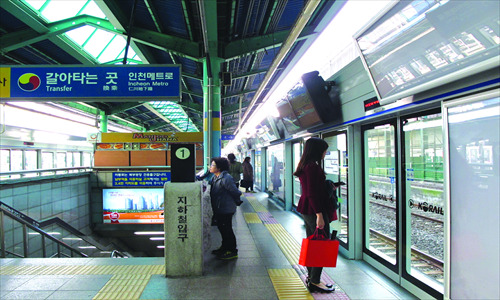 Take the Seoul Metro Line 1 all the way to the end to arrive at Incheon Station. A bus stop outside runs bus routes No.2, 23 and 45, all of which go to Wolmido Island. What to try: Take a Mulbumcar, or an eco-friendly electronic motor vehicle around the island when your feet tire. Named after the Mulbum seal serving as the mascot to the Incheon Asian Games next year, a one-way ticket around the island is 1,000 won ($0.94) for adults, while a roundtrip costs 1,500 won. Children's tickets are priced at 500 won and 800 won, respectively. Kids under 6 years old ride free. When to go: The island's weather is fairly pleasant year-round. Best to avoid rainy season though, which runs from June to July. The hottest month is August. The most ideal temperatures are in September, but visiting at this time means you will share the island with more tourists. Where to stay: In case you want to spend more time on the island, there are a few hotels around. But generally speaking, one day is enough and public transit to Incheon runs late into the night to allow you to make the most of your trip to the island.